24 July 2009; Aria Air Ilyushin 62M, Flight 1525; Mashhad, Iran: The aircraft was on a scheduled domestic flight from Tehran, Iran to Mashhad, Iran. After landing, there was a tire burst and the aircraft skidded on the runaway, hitting an airport fence and an electricity pylon. The normal landing speed for an Ilyushin 62 would have been between 145 and 165 mph, but this accident aircraft reportedly landed at a speed of 197 mph. The airplane ran off the runway and collided with a wall located about a kilometer from the runway. The front section of the aircraft was completely destroyed in the crash, and there were 16 fatalities among the 153 passengers and 13 crew members. 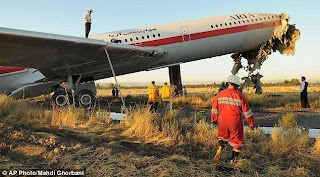 This is the first fatal crash for Aria Air, and the 12th fatal passenger crash for the Ilyushin 62 since it began passenger service in the 1960s. This crash comes less than ten days after the last fatal plane crash in Iran. All 168 passengers and crew on that Caspian Airlines flight were killed. Shortly after the accident, the airline's flight certification license was revoked by the Iranian civil aviation authorities.